The central government has proposed to exempt file notings and cabinet papers from the RTI law. The government's idea that it can 'reveal the decision but not the reason for it' is anti-democratic. In democracy, people need reasoned decisions, reasons for decisions and not mere decisions without reasons, says Madabhushi Sridhar. 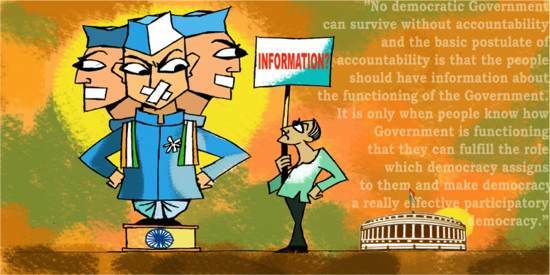 The Right to Information Act, 2005 (RTI) is facing turbulence from the bureaucracy even before it celebrates its first birthday. A powerful lobby of the bureaucracy has apparently been successful in prevailing over the coalition government at the Centre and convinced it to amend the law. Termed by many as a retrograde step, the proposed amendment is far reaching because it envisages barring 'file notings' from access by citizens. But file notings are every thing in the process of decision making, and if they are blocked, it drops an iron curtain on public records, which is against the very aim of the RTI law. 1. All file notings to be exempted except for social and development projects. 2. No cabinet paper to be disclosed even after a decision has been taken. Both of these amendments are fatal to the letter and spirit of the main Right to Information Act of 2005. File notings were not exempted from disclosure even under Section 8 of the law (which covers exemptions) or any where else. The government's intent in confining it only to social and development projects is a very worrisome limitation. Any file note may end up being considered as not pertaining to social or development project, just to deny access. Further, in the current law, cabinet papers are allowed to be disclosed for a decision that had been taken. This includes file notings, deliberations in the cabinet and the material papers over which the decision had depended. The Manmohan Singh government now wants to deviate from the earlier commitment by excluding every cabinet paper through the proposed amendment. What are files and file notings? A file in public office is nobody's private affair. Any such file contains various documents including file notings which indicate the process and steps involved in making a decision. File notings are the life of the file and the source of decisions taken. They are that part of the file on which officers of different ranks write their comments. Filing notings are not an individual officer's opinion note, but a compilation of different opinions and analysis of all the positions and application of rules to a particular situation so that the final authority - like the Chief Secretary or Chief Minister or a Council of Ministers -- takes an appropriate decision, in public interest. File notings, thus, offer the reasons for the decision. Though it is the the government that takes a decision, it is taken for the purpose of people and their welfare. The claim of the government that it will 'reveal the decision but not the reason for it' is anti-democratic and against the norms of administrative law. If the file note is not accessible, the reasons for the decisions become 'classified'. In democracy, people need the reasoned decisions, reasons for decisions and not just decisions without reasons. To propose that the government will now deny the reasons for decisions is itself an unreasonable decision of the UPA executive. It is a principle of administrative law that the cabinet decisions and debates should be revealed to the people, unless they disclose any sensitive and security information. Parivartan, a voluntary organisation, obtained file notings regarding the privatisation of water management in Delhi, in 2005. The notings revealed that Price Waterhouse Coopers did not even qualify in the preliminary round, but the World Bank twisted the arm of the Delhi Government to cancel bids, force rebidding and ultimately changed the selection criteria. File notings also revealed that some honest officers had protested. If Parivartan had not exposed this using the RTI Act, the deal could have made the Delhi citizens shell out more than 10 times the to present rates of water. The file notings also revealed that how the son of a VVIP was appointed as consultant by Delhi Jal Board without any advertisement or interview. File notings can save thousands of crores of rupees for a nation like ours. Enron is the example of a disastrous deal for a high cost electricity between Dhabol Power Company (of Enron) and Maharashtra Electricity Board, guaranteed by Government of Maharashtra and Government of India, which ran into trouble and ultimately closed down. All this could happen because the terms of agreement were kept secret and not revealed in spite of the demand from NGOs in Maharashtra. The people need right to such information which will be hidden in invisible folds of file notings. Despite all this, the steel frame of the country, the bureaucracy, loves their file notings and prefers to keep them close to their chest, because the file notings reveal them totally. So, they do not want it to be known on request. According to the RTI law, file notings are not exempted from disclosure unless they fall under general clauses of exceptions and exemptions, defined in section 8 of the law, which we will come to later in this article. Still, the state machinery had wanted to secure file notings and was perhaps never comfortable with their access by citizens. If this amendment is passed, the definition of 'information' under the access law suffers a dent. Section 2(f) of the RTI law says: "Information means any material in any form including records, documents, memos, e-mails, opinions, advices, press releases, circulars, orders, logbooks, contracts, reports, papers, samples, models, data material held in any electronic form and information relating to any private body which can be accessed by a public authority under any other law for the time being in force." File notings are covered under the expressions 'any material in any form' and 'opinions, advices'. The nature of file notings is inevitably that of advice, opinions, recommendations or suggestions etc., which are specifically covered by the above definition of 'information'. Exempting file notings will limit the expressions such as 'file', 'information', 'opinions' and 'advice' in Section 2(f) in the Act. Similarly exclusion of notings would completely nullify the operation and the import of Sec. 4(1)(c) and (d) which requires every public authority to proactively "publish all relevant facts while formulating policies or announcing the decisions to affected persons" and "provide reasons for its administrative or quasi-judicial decisions to affected persons." Sec. 4(1)(b) of the Act makes it mandatory for every public authority to publish amongst other things - "the procedure followed in the decision making process, including channels of supervision and accountability" and "the norms set by it for the discharge of its functions." Do exemptions currently in force through Section 8 already apply to file notings and cabinet papers? The category of 'file notings' does not figure under Section 8(1) of the RTI Act, which lists out the types of information that the government is under "no obligation to give any citizen". Thus, the file notings come firmly within the access as per the RTI Act and must be made public on request. Even where notings may fall within the Section 8 criteria, they can still be made public where the public interest is served in disclosing the information. As regards cabinet papers, Section 8 mentions cabinet papers including records of deliberations of councils of ministers, and provides that "decisions and the material on the basis of which decisions were taken shall be made public after the decision has been taken". Clearly, the Act requires that not only must decisions be made public, but the reasons and the material on the basis of the decisions be made public after the matter is complete and over. Even cabinet papers which may otherwise be exempt from disclosure, under Sec. 8(1)(i) of the Act are still ultimately subject to disclosure. The Manmohan Singh government now proposes to amend the law so that that the "material on the basis of which decisions were taken" is deleted from clause 'F' of Section 8. The proposed provision says: "No cabinet paper would be disclosed even after a decision has been taken." This would put cabinet notes, records and other documents based on which the decisions are taken, also out of the reach of access and out of the Central Information Commission. The central government has every authority to amend this access legislation. Apart from this general power, Section 30 of the Act empowers to remove difficulties, hindrances and obstacles to give full effect to the goals and objectives of the law. Under Section 25(3)(g) of the Act, Ministries can also recommend amendments for enforcing the right to access information. But the proposed amendments are neither initiated by ministries nor intended for removing any difficulties. Instead they propose to destroy the accessibility to a maximum extent. If the amendment is really needed, it should have been based on the practical experience. The RTI law also needs to be made difficult to amend as any political party at the office might me interesting in hiding any sort of information from the people. Finally, it is for the people to secure the hard-earned right to information. In January this year, ruling in a case concerning the refusal of the public sector Telecommunications Consultants India Ltd. (TCIL) to provide a file noting, the Central Information Commission ruled that unless the public authority clearly specified that the file notings relate to commercial confidence or trade secret or intellectual property or available to TCIL in its fiduciary relationship, the appellant should be given file noting on the document specified. On 1 December 2005, Prime Minister Manmohan Singh had instructed the Department of Personnel and Training (DoPT) to exempt file notings on identifiable individuals, organisations, appointments, and matters relating to inquiries and departmental proceedings from the purview of the RTI Act. However, the government had said that "substantive file notings" relating to plans, schemes, programmes and projects of the Government related to development and social issues could be disclosed. Reacting to this, Dr O P Kejariwal, one of the Central Information Commissioners, wrote a letter to the central government opposing the order. He described it as the first blow to the Act widely seen to be one of the most important pieces of legislation to have been enacted in independent India. As the backdoor methods did not work, and rulings from Information Commission are apparently opposing these attempts, the Union Cabinet on 20 July 2006 announced its decision to amend the law to exclude notings on files by officials from the ambit of this law so that the CIC's decisions on notings would become ineffective. The Union Information and Broadcasting Minister, Priyaranjan Das Munshi said: "Decisions can be conveyed, not in terms of details about what the under secretary or joint secretary wrote or what the secretary disapproved". He thus made it clear that details of the notings - "who said what" at various stages of the decision-making - would be out-of-bounds for the public. The proposed amendment also accedes to the UPSC's request that the sensitive area of its selection process be put out of the RTI law's purview. Unfortunately the UPA Government is not hesitating to sacrifice the 'life' of the access law to secure 'file' of decisions. There is a satiric remark on files in Secretariat, where the 'not approved' becomes 'note approved' at a later point of time, without any substantive reasoning. To add that letter 'e', what transpires under the table or behind the curtain is left to anybody's imagination. If the file notings are kept 'covered', the reasons for changes and reversals of decisions will never be 'discovered' and discussed. Hiding files and file notes amount to encouraging or hiding corruption, and allowing the official and non-official public servants not to be accountable. It is a principle of administrative law that the cabinet decisions and debates should be revealed to the people, unless they disclose any sensitive and security information. Government should understand that the secrecy or classification of information must be confined to security interests, privacy issues, and trade related rights, and no more than that. In fact, the information is generated for the people as those files pile up on the initiative of a representation or complaint or requirement. A file in public authority is not compilation of documents containing trade secret or pieces of poetry copyrightable to the writer. It is the data generated, opinions sought, precedents analysed, pros and cons discussed and impact on public exchequer examined, for advancing the public interest or answering a vociferous public demand, etc. Furthermore, in any democracy the discussion should precede the decision. The information on the file and its notings is neither the property of the officers who express opinion based on their experience and performance of a legal obligation, nor the property of the government. If the cabinet has preferred not to decide on a particular item of agenda, why should it not reveal the reasons for deferring the decision? Why not let the people know who said what on that vital issue connected to the welfare and development of the people? Neither the UK nor USA or Australia have exempted file notes from the access to public. In India also, both the Judiciary and Parliament are long used to functioning openly without any adverse effects and it is only the bureaucracy that presently functions under this unnecessary veil of secrecy. Amending the law to take away file notings from the public domain is a retrograde measure that will appease only that miniscule part of officialdom that stands to unduly benefit from such secrecy and denies the people the benefit of their own information, their empowerment and active participation in democratic decision making process. The character of state and sovereignty is manifest in three important wings- Executive, Legislature and Judiciary. As the open trial is the basic norm of judicial enquiry, the courts always function in public, while every aspect of proceedings in legislature is reported in media or recorded and made available to all. Most of the legislative proceedings are now being telecast live. The only wing that runs in secrecy is the Executive. The decisions at the Council of Ministers level or secretary level are not easily available to common people, which leads to absence of accountability of decision makers. Even if the decisions are made available by spokesperson of the cabinet, the reasons for decision, and different opinions expressed before they arrived at that particular decision are usually beyond access. This has been our Executive's culture, and seen from this vantage point, the RTI law of 2005 was a path-breaking legislation that gave people the power to demand information that is rightfully theirs. In sum, the promotion of "transparency and accountability" in the working of public authorities - the stated object of the landmark RTI legislation - does not stop merely with making the decisions of government public. It also lies - and critically - in making it possible for people to know on what grounds these decisions were taken. Access to file notings by officials is necessary to evaluate the process of decision-making, to understand such things as which options were considered, which were not, and why some were rejected. It is not proper to close the doors before they are fully opened and the 'enlightenment' transformed into empowerment. Madabhushi Sridhar Acharyulu is a Professor at the NALSAR University of Law, Hyderabad.